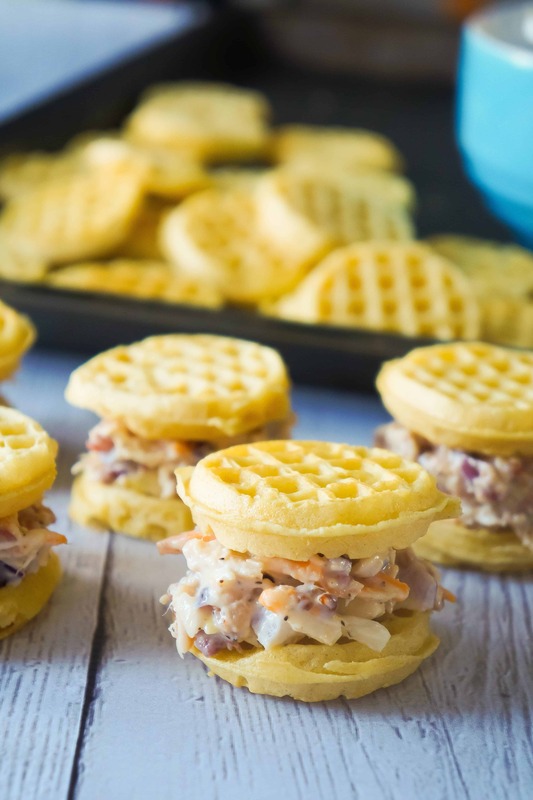 Mini Waffle Maple Bacon Chicken Salad Sandwiches are a great appetizer or party snack. These adorable mini sandwiches are made with Mini Eggo Waffles. Bacon and maple syrup add great flavour to the chicken salad mixture and complement the waffles. I used some grocery store rotisserie chicken for this recipe but you could also precook your own chicken. To make these mini waffle sandwiches I started by toasting the Mini Eggo Waffles in the oven until they were nice and crispy. For the chicken salad I combined some shredded rotisserie chicken with real bacon bits, red onions, mayo and maple syrup. I topped half of the waffles with a large spoonful of the chicken salad and then placed the remaining mini waffles on top to form sandwiches. These mini chicken salad sandwiches are cute and delicious. I love the added sweetness from the maple syrup. 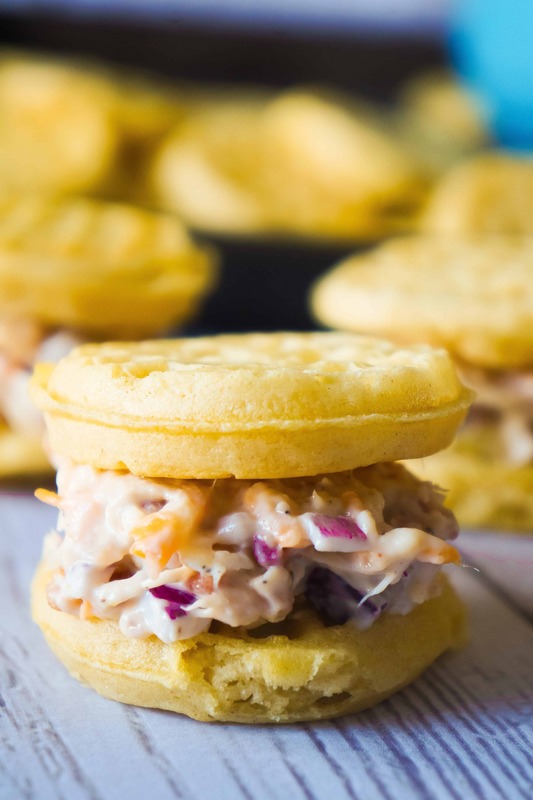 Mini Waffle Maple Bacon Chicken Salad Sandwiches would be the perfect snack for your next party or gathering. If you are looking for a great party snack for Superbowl Sunday be sure to give these mini sandwiches a try. 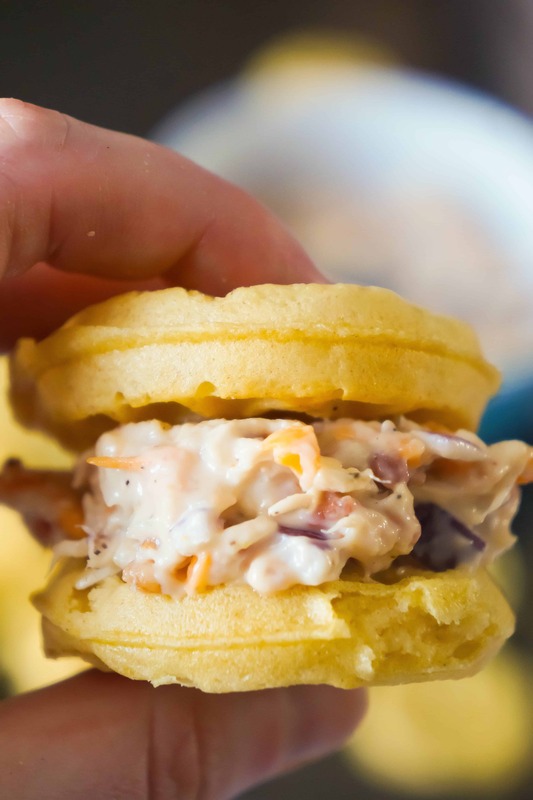 If you are looking for more party food ideas check out Sweet Chili BBQ Chicken Sliders, Bacon and Onion Dip, Cream Cheese Bacon Chicken Tacos, Bacon Bruschetta Party Dip and Shepherd’s Pie Sliders. 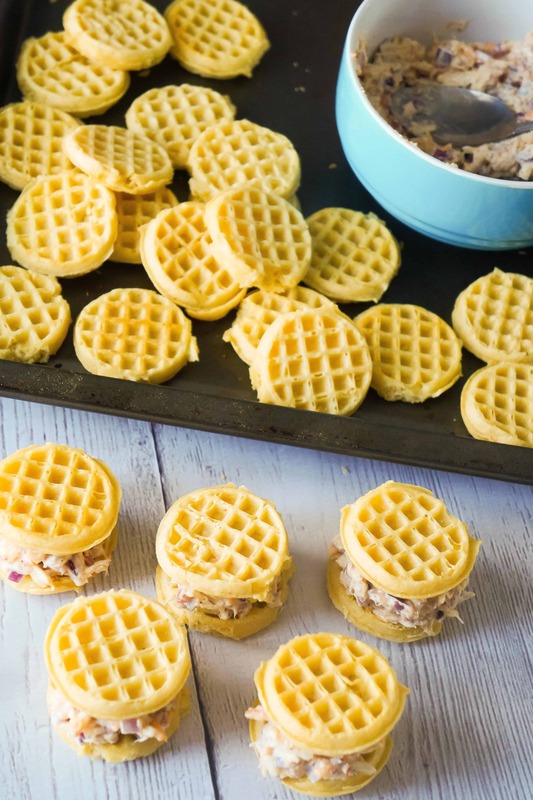 Mini Waffle Maple Bacon Chicken Salad Sandwiches are great party snacks. These mini chicken salad sandwiches would be the perfect finger food for your Superbowl party. The filling is loaded with shredded rotisserie chicken, bacon and cheddar cheese. Place mini waffles in a single layer on a large cookie sheet. Cook waffles until crispy. 5-6 minutes. Set aside. In a medium mixing bowl combine shredded chicken, bacon bits, diced onions and mayo. Stir well. Add shredded cheese, salt, pepper and mayo. Stir until fully combined. 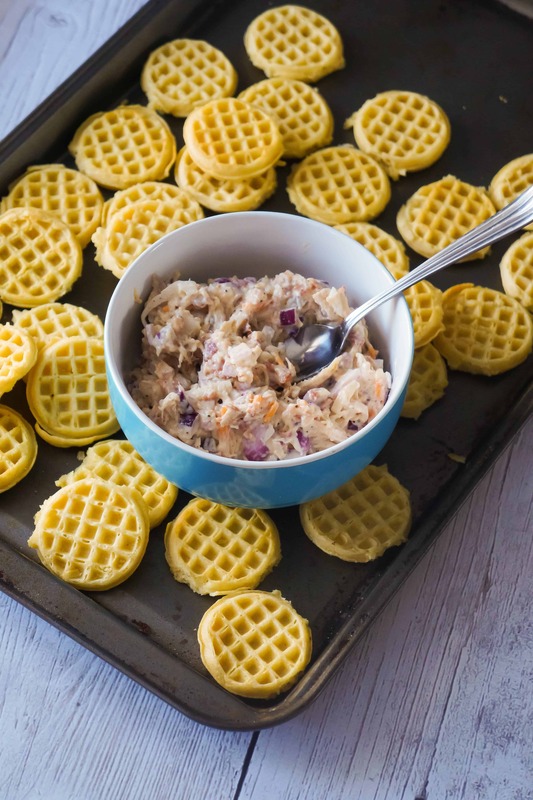 Place a large spoonful of the chicken salad mixture onto 16 of the mini waffles. 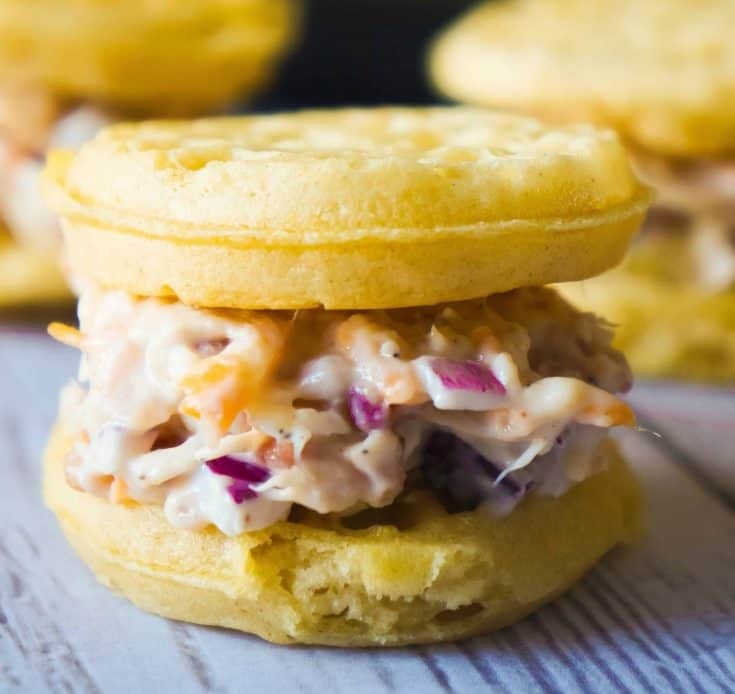 Place the remaining mini waffles on top of the chicken salad to form sandwiches.